Mix all ingredients and half of the almonds (chopped) and knead for some minutes. Put the dough on an oven plate and roll it out until it is half a finger thick. Put the rest of the almonds on top. Bake in the oven at 200 degrees for half an hour. 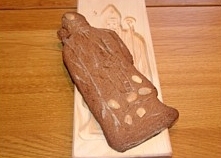 Speculaas is a Dutch recipe. It should be made with almonds. However, when I prepared the speculaas this time, we were on the verge of leaving from Uzbekistan to Bangladeshand the kitchen stock was almost finished, so the only thing I could find was cashew nuts. Luckily they were unsalted. I recommend however the use of almonds! Mix flour, sugar, cold butter, half an egg and a little bit salt, knead to a dough. Leave the dough in the fridge for half an hour. Roll the dough out and cut circles with the help of a big class. Put some almond paste on a circle, put water on the edges and lay another circle on top. Press the edges with a fork. Spread the rest of the egg over the top of the shortbread and put an almond in the middle. Bake half an hour at 160 degrees in the oven. Almond filled shortbread is again a very Dutch recipe, in the Netherlands it is called "Gevulde koek" which means stuffed biscuit. All Dutch know that the stuffing is supposed to be almond paste, even though cheap versions in the supermarket can be filled with ground white beans, a cheap and not so very tasty replacement of almond paste.